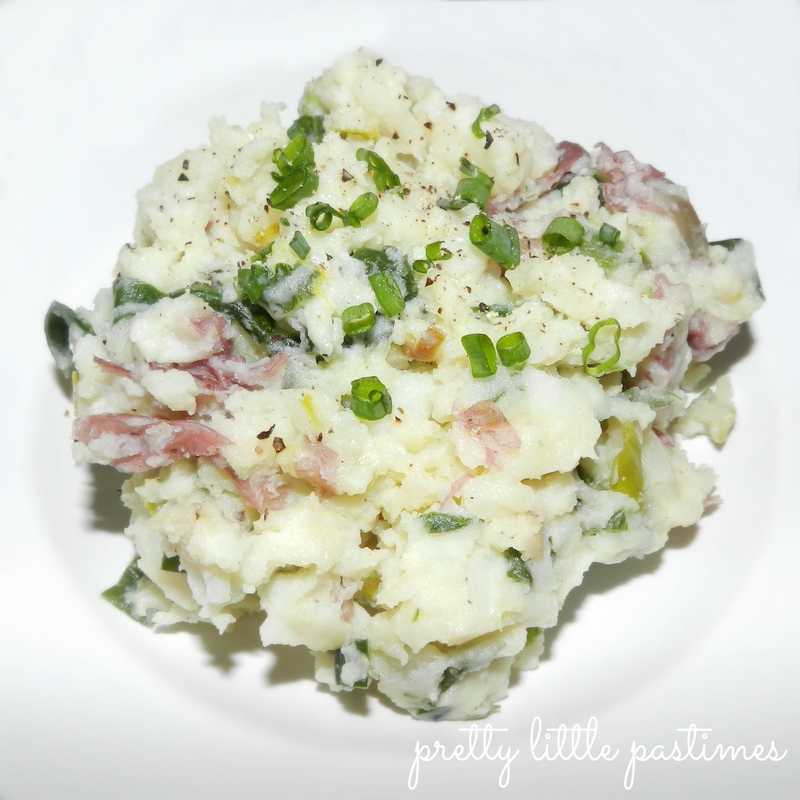 If you like potato and leek soup, you will love these garlic and leek smashed red potatoes! We have a list of staple starch side dishes in our house which include potatoes, rice and orzo, but I have been experimenting more and more with new variations on old favorites. We saw these fresh leeks while wandering around the produce section earlier this week and added them to our rapidly filling cart. If you haven’t cooked with leeks, keep in mind that they are in the same family as garlic and onions, but have a sweeter flavor. Unlike garlic and onions, there is no bulb on a leek and everything other than the root and stem base is edible, although most avoid the dark green section. Leeks are a good source of Vitamins A, B6, C and K, folic acid, calcium, magnesium, potassium, iron and fiber. They can be eaten raw, steamed, baked or sautéed, but avoid boiling as they will lose a majority of their nutrients. 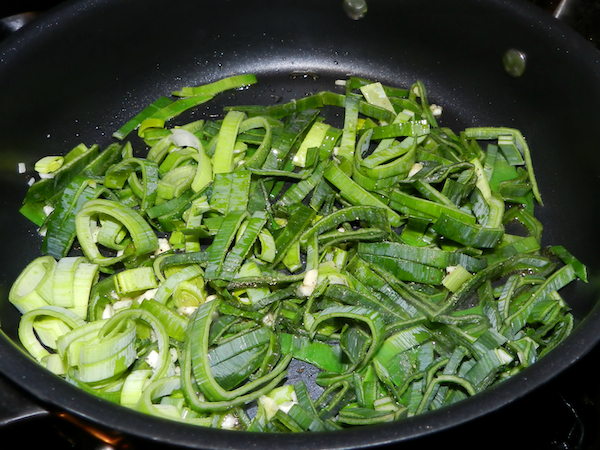 Before working with leeks, rinse them well; dirt may be stuck between the tight leaves. Then trim the root and stem. I choose to only trim about an inch from the darkest green end of the leek, since most of the nutrients are found in the green section. Now they are ready! In a medium saucepan cover potatoes with water and generously season with salt. Bring to boil and let simmer for 15 minutes or until easily pierced with a fork. While the potatoes are cooking slice the rinsed leeks into thin rings. Heat the olive oil in a medium skillet over medium heat. Add the leeks and garlic, season with salt and pepper and sauté until the leeks are softened, about 7 minutes, adding the pancetta halfway through. Drain the potatoes and place them in a large bowl with half of the milk (1/8 cup) and the 2 tablespoons of butter. Using a potato masher, mash and add the additional milk by the tablespoon, until potatoes reach desired consistency. Fold in the leek mixture and season with salt and pepper. Top with freshly chopped chives and serve warm. These potatoes are a great twist on a very simple recipe. 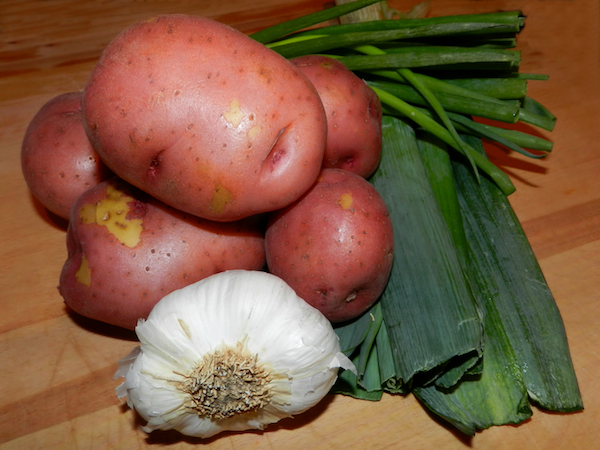 The addition of the garlic and fresh leeks give these potatoes some new life. They make a great side for countless main dishes, plus they heat up well the next day … if you have any left over! Enjoy!